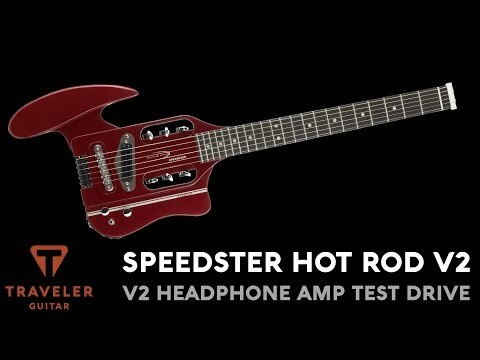 The Traveler Guitar Speedster Hot Rod is built for portability and performance with a full 24 ¾”-scale neck and a built-in Pocket Rockit headphone amp, which produces clean and distortion tones through headphones or an amp. In addition, the Speedster Hot Rod is loaded with a 1/8” inch aux-in jack so players can plug in an mp3 player and jam along to their favorite songs. The final touch: a sleek racing stripe underlining the new Hot Rod logo. The Speedster Hot Rod fits neatly inside its included gig bag and stows easily in airline overhead compartments. Weight : 4 lbs. 12 oz. Weight in Gig Bag : 5 lbs. 7 oz.